Elvis in January—it was often a "going-back-to-work" month for him following spending the holidays at home in Memphis. As you'll notice on the list below, Elvis recorded some of his biggest hit records during January. Also, it was a big month for his live TV performances in 1956, 1957, and 1973. Finally, Elvis started work on two of his movies during the first month of the year. January 10, 1956 — Elvis recorded “Heartbreak Hotel” at RCA studios in New York City. January 27, 1956 — “Heartbreak Hotel,” RCA’s first official Elvis Presley record lease, was shipped to retailers across the U.S.
January 30, 1956 — Elvis recorded “Blue Suede Shoes” at RCA’s New York studios. January 6, 1957 — Elvis appeared for the final time on “The Ed Sullivan Show.” Elvis sang “Peace in the Valley” on the program. January 12, 1957 — Elvis recorded “All Shook Up” at Radio Recorders in Hollywood. 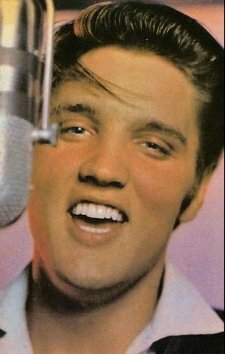 January 15, 1957 — Elvis recorded “Teddy Bear” at Paramount studios in Hollywood. January 20, 1958 — Paramount began principal photography on King Creole, Elvis’s fourth motion picture. January 28, 1963 — Paramount began principal photography on Fun in Acapulco, Elvis’s 13th motion picture. January 16, 1971 — At age 36, Elvis was honored by the Junior Chamber of Commerce of America as one of the “Ten Outstanding Young Men of the Year” at an awards ceremony in Memphis. January 13, 1973 — Elvis’s “Aloha From Hawaii” TV special concert was held at the International Convention Center in Honolulu. 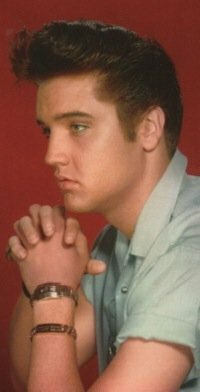 On January 5, 1957, Billboard magazine reported on a mysterious case of damaged Elvis records. Larry Kanaga, then vice-president and general manager of RCA’s Record Division, heard the true story at a convention of record distributors in Indianapolis. It seems that a supermarket manager called up the local RCA record jobber and complained that all the Elvis Presley 78’s he had on display were broken. The jobber couldn’t understand it, but he replaced the broken records in the supermarket. Several days later, however, the manager called back again with the same complaint. All the replacement records were broken. The jobber replaced the Presley records again, but this time he made the delivery himself, inspecting each disk as it put it on the supermarket rack. Then, positioning himself in a spot where he could observe the rack unnoticed, the RCA rep sat down and waited. He didn’t have to wait long. Soon he spotted a little old lady with a cane walking down an aisle toward the record rack. She walked up to the Presley display, and, after taking a look around, raised her cane and gave the records a couple of whacks. The mystery was solved, but Billboard made no mention of what, if any, action was taken against the old lady for her act of vandalism. Perhaps an appropriate punishment in this case would have been being forced to sit and listen to Elvis’s records for several hours. Elvis Presley’s career has always been defined by numbers—big numbers. In a January 15, 1964, article, Variety used some big numbers to assess Elvis’s career to that point. The article opened with the following paragraph. Variety then went out to reveal one big Presley number after another. According to RCA Victor figures released the week before, Elvis’s single record sales during his eight years with the company totaled 49,300,000. He also had sold 11 million LPs and 12 million EPs. The 15 movies in which he had appeared from 1956-1963 had brought in an estimated $75 million in box office receipts. Colonel Parker told Variety that Elvis had taken in $1.5 million in straight salary for his two 1963 films, It Happened At the World’s Fair and Fun in Acapulco, with 50% of the profits still to come on top of that. The Colonel also explained that he had turned down all TV offers, which ranged up to $150,000, and personal appearances, estimated at $75-100,000 per week, because he said Elvis didn’t have the time to do them. January 3 — Marty Lacker, Elvis's right hand man for many years and co-Best Man at Elvis's wedding, was born in 1937. He died on February 13, 2017. January 5 — Sam Phillips, owner of the Memphis Recording Studio and Sun Records, where Elvis first recorded professionally, was born in 1923. He died in 2003. January 8 — Elvis Presley was born in Tupelo, Mississippi, in 1935. He died in 1977. January 8 — Joan Freeman, Elvis’s costar in Roustabout, was born in 1942. January 19 — Shelly Fabares, Elvis’s costar in Girl Happy, Spinout, and Clambake, was born in 1944. January 21 — Mac Davis, who wrote Memories, In the Ghetto, and Don’t Cry Daddy for Elvis, was born in 1941. January 22 — Bill Bixby, Elvis's costar in Clambake and Speedway, was born in 1934. He died in 1993. January 26 — Sid Wayne, who co-wrote 32 songs for Elvis, including “Lover Doll,” “Flaming Star,” and “I Need Your Love Tonight,” was born in 1923. He died in 1991.